Simplex Techtree is divided into five branches, each with two strands. 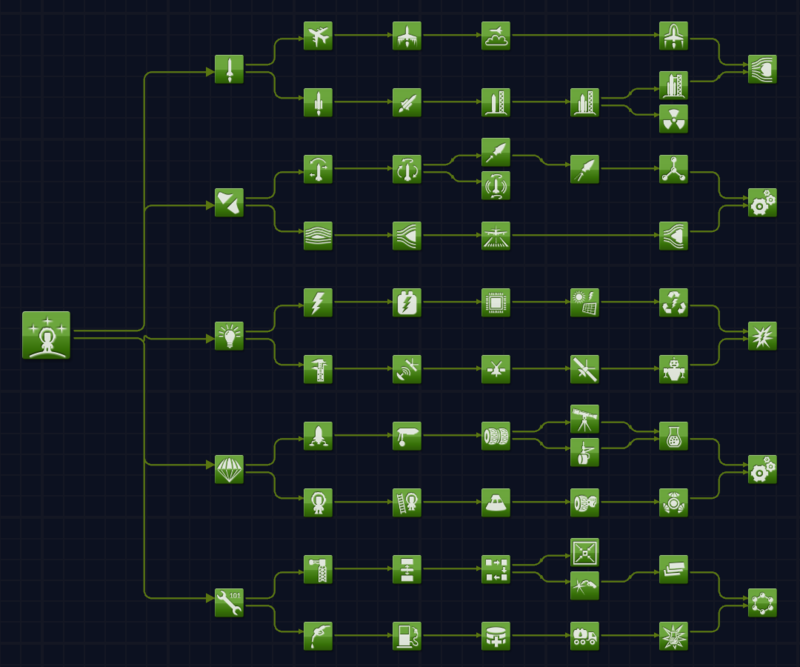 All nodes are based on Stock, and around half the parts have been moved for balance. Making History is supported. It is possible to play un-crewed before crewed! This mod includes also includes a separate engine reconfigure to make it a little more difficult to launch from Kerbin (and any atmosphere). This cfg file that can be removed, keeping the TechTree intact (SIMPLEXEngines.cfg). The purpose of this minor reconfigure with engine parts is to make it more likely to need a two or three stage rocket to achieve orbit. Vacuum thrust and ISP have not been adjusted, so all craft designed for vacuum will not be affected. But any part mod will be near enough to the right place. Ask in the Forums for specific changes and additional support. Peace. Effectively a hotfix becasue SIMPLEXResources and SIMPLEXLiving got accidentally added in 1.7. This would have caused ISRU Ore fun for people (Resources) but issues for Scientists who would not have been able to reset ScienceJr and also Goo. Now resolved. If you are updating from 1.7 for a current save it will affect resources (Ore). I recommend keeping the SIMPLEXResources folder in that case. Deleting SIMPLEXLiving will not affect anything but fix your problem with Scientists. A couple of mods had some sets of parts hidden upon load. This is now resolved. Making History Engines added as these had been overlooked! The Procedural Fairings is still a WIP but the parts are where they should be. A wee cleaning of code. Size3 Fairing moved back one node. HullCamVDS      https://spacedock.info/mod/885  not actually present but all parts are in a great location already! Thanks for downloading SIMPLEX TechTree!